As part of the execution of the Schlieffen Plan, Belgium had been invaded by Germany. Following the Siege of Antwerp, the remnants of the Belgian Army were pushed back to the far south west corner of the country, and decided to make a stand behind a 22 mile long front on the Yser Canal as the Germans tried to reach the French Channel ports of Calais and Dunkerque. Just to the south the First Battle of Ypres took place at the same time as the Battle of the Yser and both battles concluded a series of unsuccessful flanking manoeuvres by the belligerents and established the trench lines of the Western front. Course of the "Race to the Sea" showing dates of encounters and highlighting the significant battles. On 25 October the German pressure on the Belgian army had grown so large that a decision was taken to inundate the entire Belgian front line. After an earlier failed experiment on 21 October, the Belgians managed to open the sluices at Nieuwpoort during the nights of 26 October to 29 October during successive high tides, thereby steadily raising the water level until an impassable flooded marshland was created up to a mile wide and stretching as far south as Diksmuide. Karel Cogge and Hendrik Geeraerts became (Belgian) national heroes for their decisive role in the inundations . On 29 October Diksmuide finally fell into German hands. 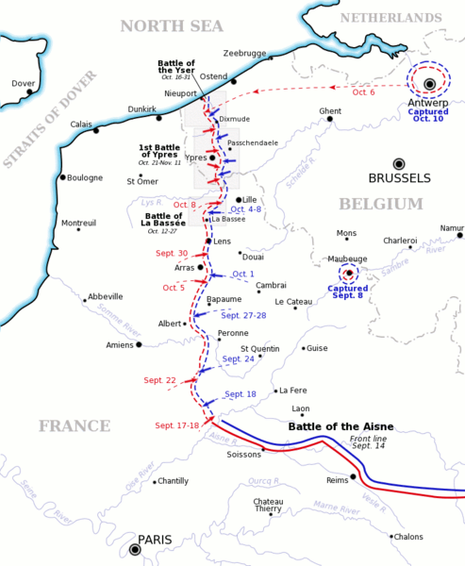 The Germans had planned another decisive attack for 30 October. The attack punched through the Belgian second line but stalled after Belgian and French counterattacks from the front and the flooding from the rear. This final attack was called off and the front stabilized. The Belgian army's defence of the Yser Canal in October 1914 is referred to as the Battle of Yser. The German offensive at the Canal, which ran south from the English Channel at Nieuwpoort in north-western Belgium, formed part of a wider battle for control of Flanders, notably at Ypres.